Abortion opponents contend the bill ensures that women who harbor doubts about ending their pregnancies will learn of a safe procedure for reversing a medication abortion. Abortion rights supporters contend that it’s based on junk science and the state would force doctors to provide dubious information to their patients. The action in Kansas comes after other states, including Kentucky and Mississippi, have moved to ban abortions when a fetal heartbeat is detected , as early as the sixth week of pregnancy. Kansans for Life, the state’s most influential anti-abortion group, has long favored an incremental approach and restrictions that it believes will survive court challenges. The Republican-controlled Kansas House approved the abortion “reversal” bill on an 85-35 vote, and the GOP-dominated Senate passed it on a 26-11 vote. The measure goes next to Democratic Gov. Laura Kelly, a strong abortion rights supporter. Kelly staff would not say whether she will veto the bill, but she told reporters last month, “I’m not sure that’s based on science.” Supporters appear to have the two-thirds majorities necessary in both chambers to override a veto. Medication abortions using Mifepristone, also known as RU-486, are the most common way of terminating a pregnancy in Kansas, accounting for nearly 60% of the total, according to statistics from the state health department. Supporters of the bill argue that a medication abortion can be safely reversed if a doctor gives a woman a dose of progesterone, a hormone, before she takes the second abortion pill. They base their arguments on a 2018 study led by an anti-abortion doctor and medical school professor in California and note that progesterone has been used for decades to prevent miscarriages. “This simply gives a woman more information about what she can do to save her unborn child,” said state Sen. Mary Pilcher-Cook, a Kansas City-area Republican. The bill’s opponents have said that while progesterone has been used to prevent miscarriages, its use for reversing a medical abortion hasn’t been adequately tested. The American College of Obstetricians and Gynecologists has disputed the usefulness of the procedure . 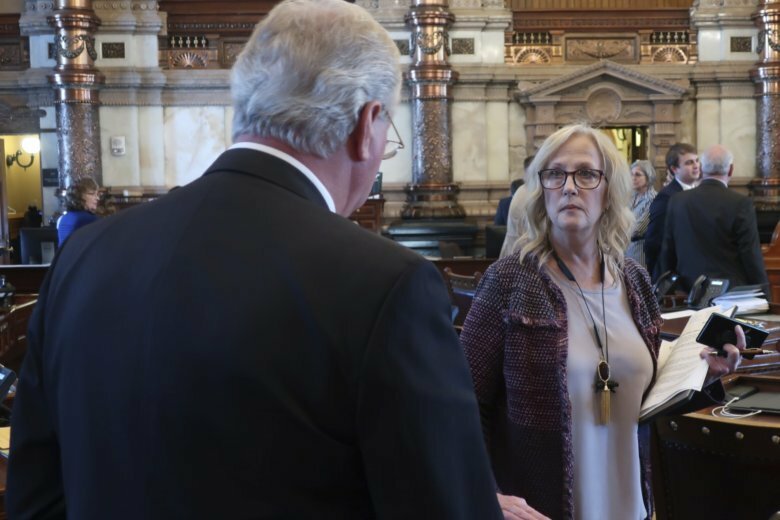 “It is not appropriate for the Legislature to practice medicine or mandate how a physician practices medicine,” said Sen. Barbara Bollier, a Kansas City-area Democrat and retired anesthesiologist. Under the bill, an abortion clinic would have a display a sign with the abortion reversal notice, and the physician would have to tell a patient in writing that a medication abortion can be reversed. A clinic that failed to post a sign could be fined $10,000, and a doctor who failed to notify a patient could be charged with a misdemeanor for a first office and a felony for a second.